Even though this film is the third in the Kung Fu Panda franchise, it is a great stand-alone film that is just so much fun. 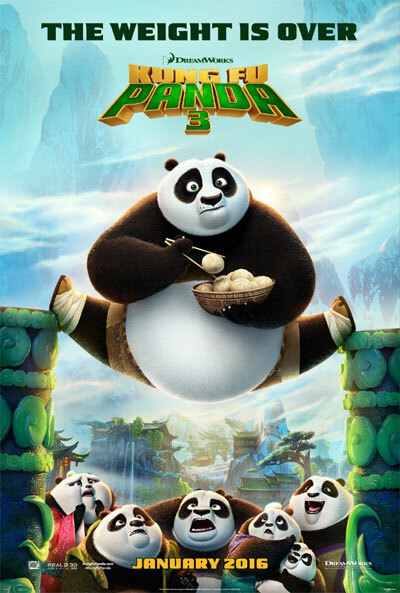 The animation is of course nothing short of spectacular, as you would expect with a DreamWorks movie, and Jack Black is just brilliant in his reprised role of cuddly panda Po. The story begins after some time as passed, and Master Shifu (voiced by Dustin Hoffman) decides to retire, passing his role of teacher to his exceptional student Po (voiced by Jack Black). When Po returns home, he discovers that his biological father Li Shan (voiced by Bryan Cranston, off of Breaking Bad and Malcolm in the Middle) has returned, causing Po's father Mr. Ping (voiced by James Hong ) to become rather jealous. And then Po has to save the world by fighting supernatural villain Kai (voiced by JK Simmons), an evil spirit warrior. The list of movie stars doing the voices for the Kung Fu Panda 3 cartoon characters is almost endless, with some huge additional names including Jackie Chan, Jean-Claude Van Damme, Kate Hudson, Lucy Liu, Seth Rogen and the hilarious Rebel Wilson. I loved every minute of this film and you certainly don't have to be a young child to enjoy the humour. The backgrounds are incredible and although there are obviously some noticeable similarities with the first two films, it didn't matter one bit. The storyline isn't exactly what you would call original and there are some striking parallels to the whole Star Wars Darth Vader thing, but the animation, fighting sequences and constant laughs are sure to make this film one of the biggest and best animations of the year! Nili Rating: 4 out of 5 - A great family film, regardless of your age, thanks in no small part to Jack Black.